Sugandh Corporation was established in the year 2010. 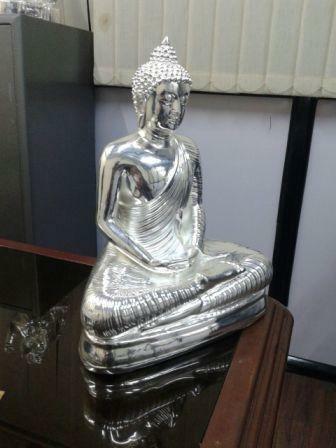 We are manufacturer, wholesaler, exporter and supplier of Silver Plated Glasses, Tray Bowl & Spoon Set, Silver Plated Tray Bowl, Glass Set, Dinner Plate Set, Silver Coating Pooja Set, Silver Plated God Idols, Silver Animal Statue, Silver Sculpture, Silver Plated Pen Stand etc. Our aim is to provide best quality best price and moreover service to our customer. Our devotion towards our customers has built a strong feeling of faith and trust in them. We assure of never ending business relations with our customers. Further, our entire range of products is well appreciated by the clients worldwide for its durability, attractive designs, scope for customization, and low price tags. Moreover, owing to the professional attitude and prolonged experience of our adroit personnel, we are able to provide quality assured products to the clients as per specifications detailed by them and too within decided time line. With the back-up of our versatile team of professionals and progressive manufacturing unit, we have been providing premium quality products to our numerous patrons. All our products are specially designed in accordance with the clients specific requirements by our professionals. In order to provide fully client satisfactory products, our professionals are fair and square with our clients to understand all their needs. Under the inspirational guidance and motivation of our mentor Mr. Deepak A. Naik, we have been able to acquire the valuable trust of our clients. Being a client oriented organization, client satisfaction is our main aim and towards which we are dedicated since the inception of our organization. Before delivering these products to our valuable clients we do complete quality inspection as to ensure no product is remains unchecked.